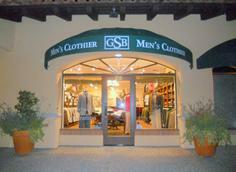 GSB Men’s Clothier opened in 2008 and continues to grow and remain ahead of fashion, serving the prestigious Rancho Santa Fe community and surrounding areas. Store is well known for the highest quality merchandise from European and American designers, providing a range of casual and elegant wear, shoes and accessories, plus custom made shirts and suits. GSB owners Gary and Bella Sanfir attribute their success to their loyal customers, with their ongoing support and kindness, while embodying a highly sophisticated taste in style and fashion, uniting everyone together to build a unique atmosphere for their European boutique. 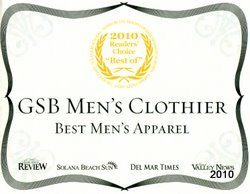 Gary is a master tailor and his career spans over 35 years in the fashion and retail business, ranging from Europe to Los Angeles styling and dressing countless celebrities and businessmen while he managed several well-known men’s clothing stores in addition to his own successful store. 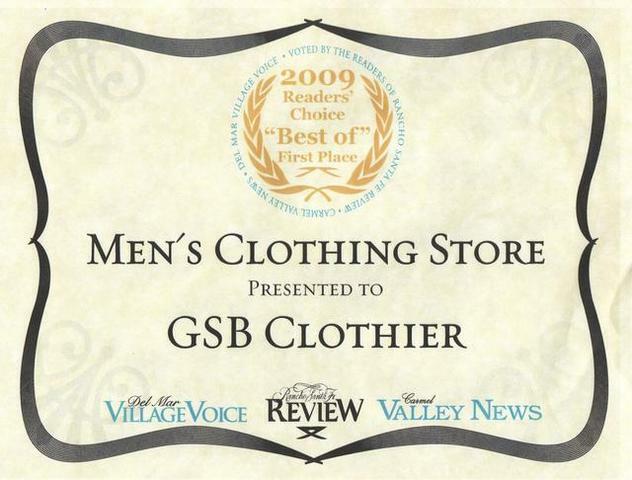 GSB has won numerous awards and recognitions, including First Place in 2010 and 2009 “Best of: Men’s Clothing Store” category of the Reader's Choice awards for Rancho Santa Fe Review, Del Mar Village Voice and Carmel Valley News Magazines. GSB is honored and enjoys supporting various San Diego area charities and co-sponsoring a variety of local events.